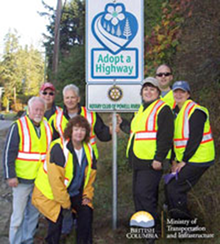 You might know that Adopt a Highway is a volunteer-based roadside clean-up program which builds community pride, beautifies BC’s roadsides and reduces the spread of invasive plants. But here are more reasons why your community or work group might want to care for two kilometres (or more) alongside a BC highway. It’s Great Exercise – Move your major muscle groups by doing litter pick-up, landscape planting, weeding, and (if you want) hand-pulling non-toxic invasive plants. You can use the trash tongs supplied, or work more of your body (think buttocks and hamstrings) by bending down to bag litter by hand. You Get to Dress the Part – We’ll outfit you in a high-visibility, “Adopt-a-Highway” marked vest, and accessorize your oh-so stylish look with orange garbage bags. These are must haves in a Adopt a Highway Circles! No Heavy Hauling – You pick up the litter, but our maintenance contractors take away the loaded garbage bags. When you find a heavy object, put a full garbage bag beside it, and the contractor will remove both items. 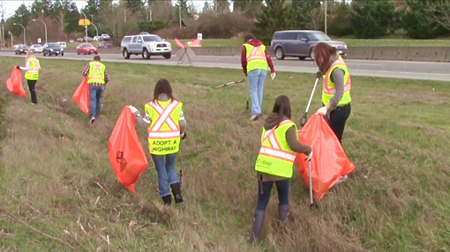 Raise Your Profile – After helping with litter pickup, your community group can request that your organization’s name be posted on a sign along your stretch of highway. Training Provided – The Ministry of Transportation and Infrastructure folks will share safety information with your group, including the Adopt a Highway Safety Rules and our new Adopt a Highway video. Your safety is the highest priority and we’ve got lots of information and advice to keep you clear of harm while you’re clearing roadsides. It Feels Good – You can take pride in the visible difference you make beautifying your community. Bond with Your Buddies – Working together in the great outdoors is an excellent way for group members to bond. Adopting groups often follow their clean-ups with barbecues, picnics or potlucks. Expand Your Knowledge – Learn to tell your tansy ragwort from your leafy spurge. Regional Invasive Plant Committees throughout the province provide invasive weeds training, and there’s a helpful website too. Halt Unwelcome Invaders – Become a weed warrior by reporting sightings of B.C.’s “most unwanted” invasive plants to the Regional Committee. 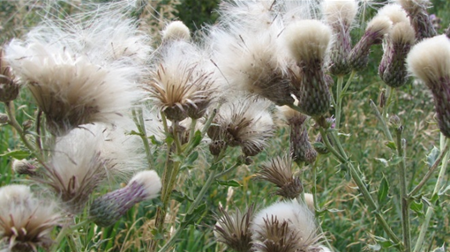 Your efforts can help beat burdock, halt giant hogweed and stop yellow star thistle. 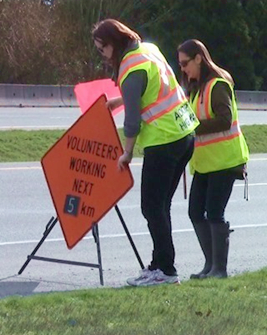 Involve Youth – Young volunteers, 12 years and up, can adopt a highway. The only restriction is an adult, 19 years or older, must supervise. Keep the Proceeds – Recyclable items like beverage containers can be kept (and cashed-in) by the adopting organization. (But if you find high-value items like wallets, money or jewelry, you’ll have the satisfaction of taking it to the RCMP). You Get Long Weekends Off – For safety’s sake, adopting groups do not work along highways during statutory holidays, the afternoon before a holiday or holiday long weekends. You and your group are free to plan your own holiday getaways, while fitting in your four times a year (average) clean-up. You Can Give them Back – You only have to adopt a highway for two years – though you’re welcome to “keep” them longer – so, it’s a limited time commitment, should your group or its priorities change. If your group decides they can’t bear to part with their highway, let us know and we can help you extend your adoption. 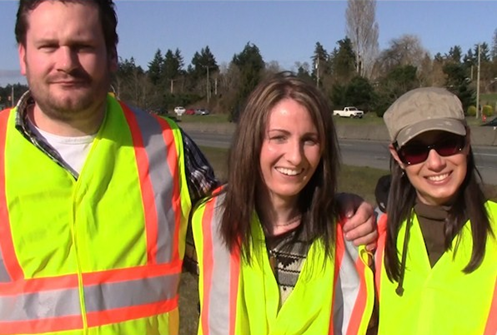 Become Part of a Movement – About 130 community groups have adopted highways across B.C. Want to find out more? Connect with Adopt a Highway on the web or contact our district office nearest you.